Partying with the backpacker crowd while traveling is fun and all, but too much travel talk can slowly drive you insane. When the “Where have you been? Where are you going?” dialogue gets old and all you want to do is drink a beer and see what it’s like to actually live in Chiang Mai, it’s time to ditch the tourists and head into “locals” territory. The last time I went to Warmup, a group of ladyboys hit on my boyfriend, and I got into a dance battle with a middle‐aged Thai man. Mostly on the radar of local college students, you will typically find an ear‐gauged, tattoo‐sleeved group of men revving up their motorbikes in the parking lot and young girls in crop tops using their best English to flirt with the handful of foreign guys. If you do happen to make it past the crowd at the bar, choose one of at least three different dance rooms to shake yo’ stuff. House music, rockabilly, that rap music that only gets air time on American radio—it’s all there. You may also happen across a band playing music seemingly fit for a 70+ bingo party, but which the college kids will go crazy for. Don’t be a grouch—try to appreciate it for the sake of doing as the locals do. 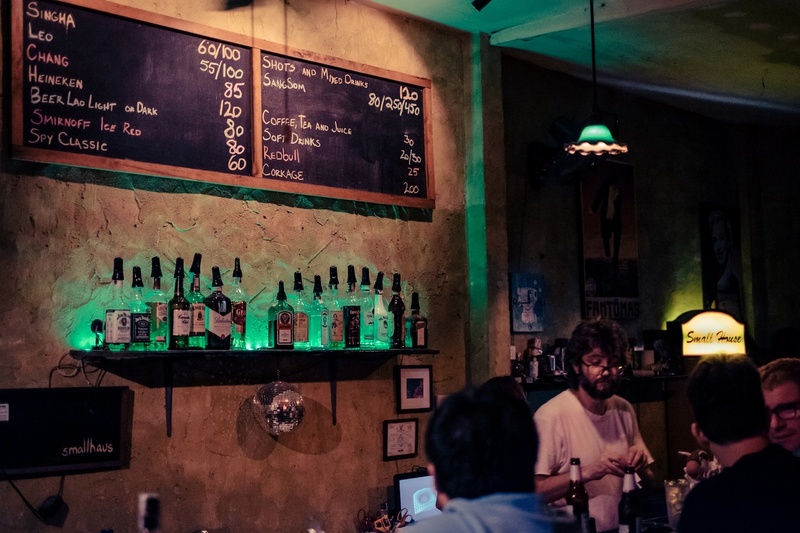 The bar itself may be a tiny hole in the wall, but the cast of characters that run it have made a big impact on the lives of the expats and local Thais who frequent it. Regulars with names like Film, B‐rat and Boy (the 22‐year‐old student and owner) spend every evening welcoming each customer as if Black Door is their home. Film is usually rapping to Big Sean; B‐rat is rousing up the party with her dance moves; and Boy can be found slinging back almost as many gin and tonics as he makes, never missing a beat in the process. Like a dive bar from back home, everyone knows everyone—and the crowd here is comprised of entrepreneurs, writers, bloggers, web designers and English teachers, all looking for a slice of home while living so far away from it. Ask Boy to make you his signature mojito, join the group in the corner playing Jenga and check out the bathroom's wall of shame, filled with photo memories of instances when regulars got embarrassingly hammered. Unleash your inner break dancer and head to Corner Bistro's weekly Hip‐Hop and Fries event. Head to the Small House Kafé for a whisky sour and talk business with local entrepreneurs. Hang with the college crowd at Warmup Café. OK, so it may be literally a Bistro on the corner by day, but on Friday nights, it’s the place to be seen. The weekly Hip‐Hop and Fries event draws a huge crowd of expats who really can’t imagine a better taste of home. With a hefty pan of hand‐made fries on the bar and the likes of Biggie, Kanye, Tupac and Big Sean playing in the background, this place is always packed. Break dance circles frequently interrupt the crowd, rap‐alongs can be heard from down the street and the surplus of twerking can easily rival a Diplo music video. When the patrons aren’t roaring their approval of the DJ for putting on “Let Me Clear My Throat,” they are huddled by the French fry platter discussing what school they teach at and if they should go to Black Door next when they shut the place down. speakeasy and outdoor seating reminiscent of your friend’s backyard, this bar draws in a more mellow crowd. Large groups of teachers and online entrepreneurs gather at candlelit tables in the yard, chatting about the launch of their latest apps and taking turns trying to pet the owner’s dog. Make sure to grab a whisky sour from the bar. With aesthetics akin to a 15th‐century indigenous home, Baan Din is one of the most unique bars in the neighborhood. Inside this clay hut, a mix of Thais and foreign expats hold deep discussions while seated at floor‐level tables and groups of locals banter by the outdoor graffiti wall. Tupac radiates from the Mac that is open to anyone’s selection, and an order at the bar may sometimes be put on hold while the owner tends to his kittens in the back. The hit‐or‐miss customer service won’t even phase you as Baan Din's mellow vibes are hard to combat. Shannon Ullman has been living an expat existence for the past two years in an attempt to figure out what to do with her life. While admittedly addicted to the search, she is learning and experiencing her way around the world. 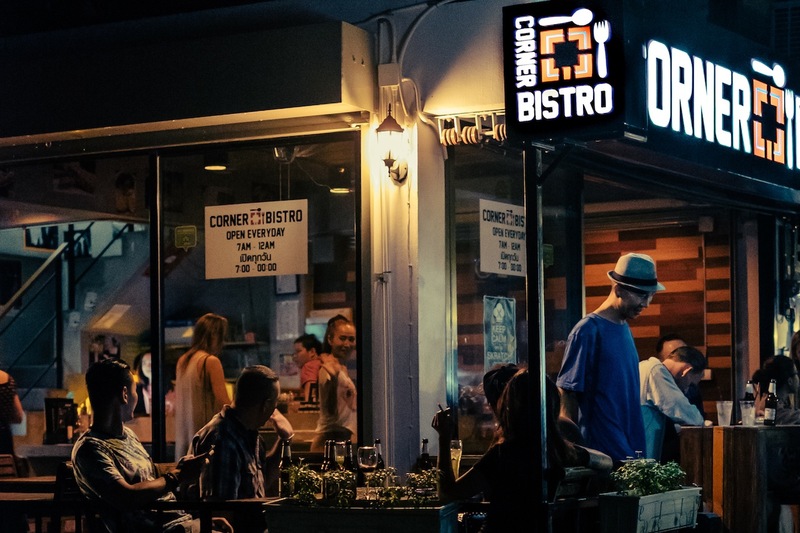 Corner Bistro was launched by two friends, born out of a simple philosophy: to bring great American food to Chiang Mai, served in a cool, relaxed setting. Classic home cooked American dishes are given unique twists, inspired by their surroundings. 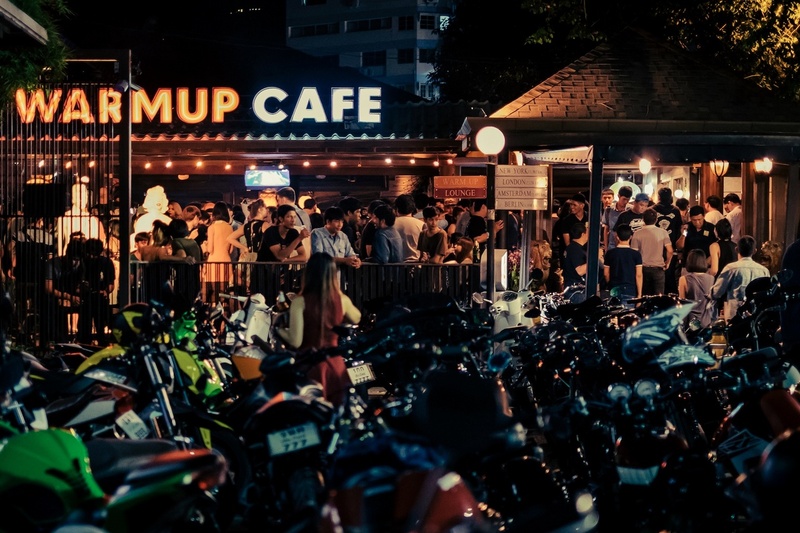 Warm Up is one of the most popular pub/nightclubs in Chiang Mai, Thailand. BlackDoor, sometimes referred to as "Black Hole" by the locals, is a popular cocktail bar in Chiang Mai, Thailand.